Lemme just start by saying that I'm feeling so out of sorts lately with this here sharing space of mine. FOR YEARS I've been so good about posting three times a week and lately, like for the past couple of months, I'm lucky if I post here once! I feel badly about it, I have so much I want to share with y'all...but have not been doing my best at making the time. Just know that more posts and videos are in the works so be sure and hang with me...I'm just struggling right now at finding a balance. How 'bout you? Here's where I'm struggling: TIME.MANAGEMENT. This has always been my biggest struggle as I'm a slacker, procrastinator, time waster and then, when I realize that the proverbial doo-doo has hit the fan, I'm a panic-er. Right now, my biggest struggle is adjusting to my new schedule this year. I start earlier (in the past, I always had a lovely morning plan time which would allow me to get ready for the day). This year, that's shortened and then, on some days, my classes are back to back...I know, we've all been there. But I'm used to having a pinch of time between my classes to prep and that's now more. By the end of my day, I'm left feeling like I have no idea WHAT just happened...and no energy to prep for the rest of the week. 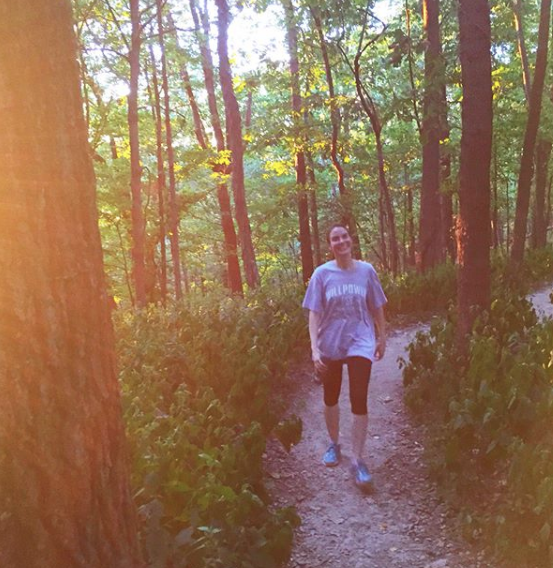 Also, as soon as I get home, Mitch and I go for about a four mile hike at the local lake. I LOVE this, we've been doing it for months...but it also means that my evening is shortened. By the time I get home, around 8:45, I feel like passing out. But I don't...because I have a terrible habit of staying up too late. Doing not much of anything. Sometimes painting, sometimes creating...when I really should be sleeping. All that to say...I'm planning to get my life together (HAHAHAHA! Life Coach Wanted!) and get on a regular blogging schedule. At least that's the plan. Okay! On with my wacky week! Thankfully, we had Monday off...but I kinda hate shortened weeks. They throw me off my teaching schedule, put some of my classes behind while others pull ahead. Don't get me wrong, I loved me a break but now I'm left with that "who am I? Where am I?" feeling. Like many of y'all, my younger kiddos are all about learning LINES right now. You can check out my line unit here. I'm also giving Dot Day a go with my first graders. 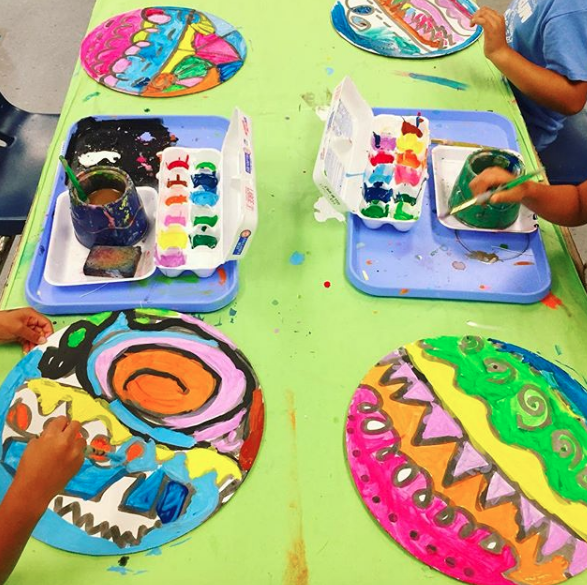 They are painting on HUGE 14" cardboard pizza rounds that I bought in a 100 pack at Gordon Food Service (Amazon also sells them). We're adding color to BOTH sides of these as we'll be hanging them like a mobile. No...they won't be ready by the official Dot Day and that's okay. 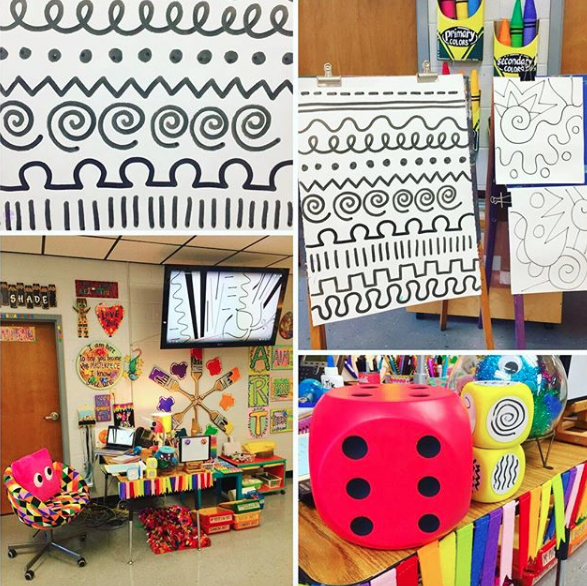 Here is a blog post filled with my favorite dot day ideas. I'm kicking off the school year with all things fibers! Because I'M INSANE. 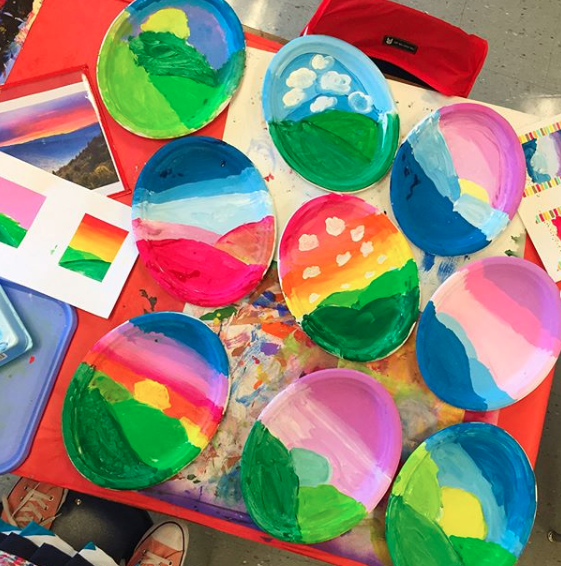 So my third graders painting landscapes on giant oval plates for their tree weaving project. These are a work in progress, still have details to add. I believe I finally remembered to take an outfit photo on Wednesday. See? I can't even keep up with that! Top from Forever 21 (size up if you get one, like everything else in that store, it runs small), skirt from Modcloth, shoes are Converse and my jacket was latch hooked by me (see top photo for the back). I couldn't wait until Friday to do a Feet Up Friday...I was wiped out only after 2 days! How do y'all distribute yarn? I always make Yarn Monsters for my kids. Basically, I take every color in my hand, start wrapping it around from my hand to my elbow until I've lost count of how many wraps. Then I cut it all with my scissors and tie a very tight knot in the middle. The kids then just pull one string out at a time...works great! Paint splatter dress made by me. 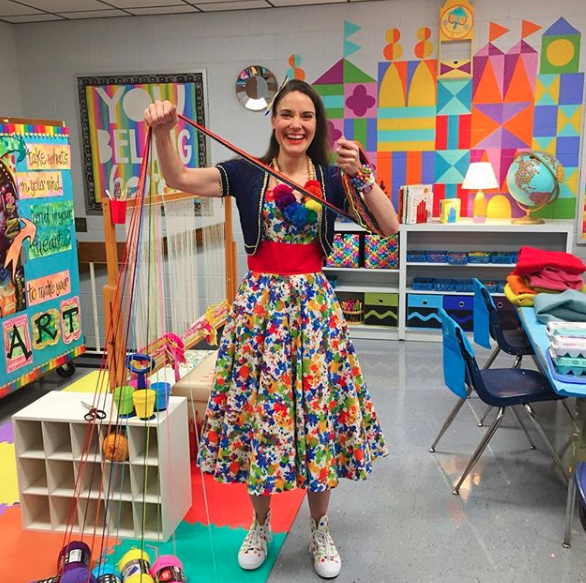 When I sew with my younger students, like second grade, we stitch on burlap. I got SUPER lucky at the thrift store and scored a rainbow assortment of fabric. I did have to cut and glue the edges (to prevent fraying) but was stoked to get so many options! I see my second graders for 30 minutes at a time. 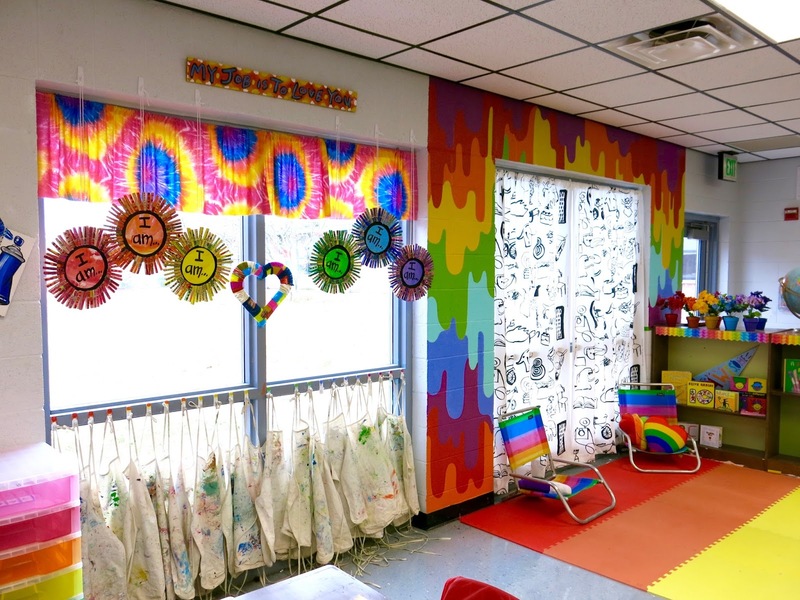 On the first day, they picked their fabric which I'd glue popsicle sticks and yarn to for a tapestry. 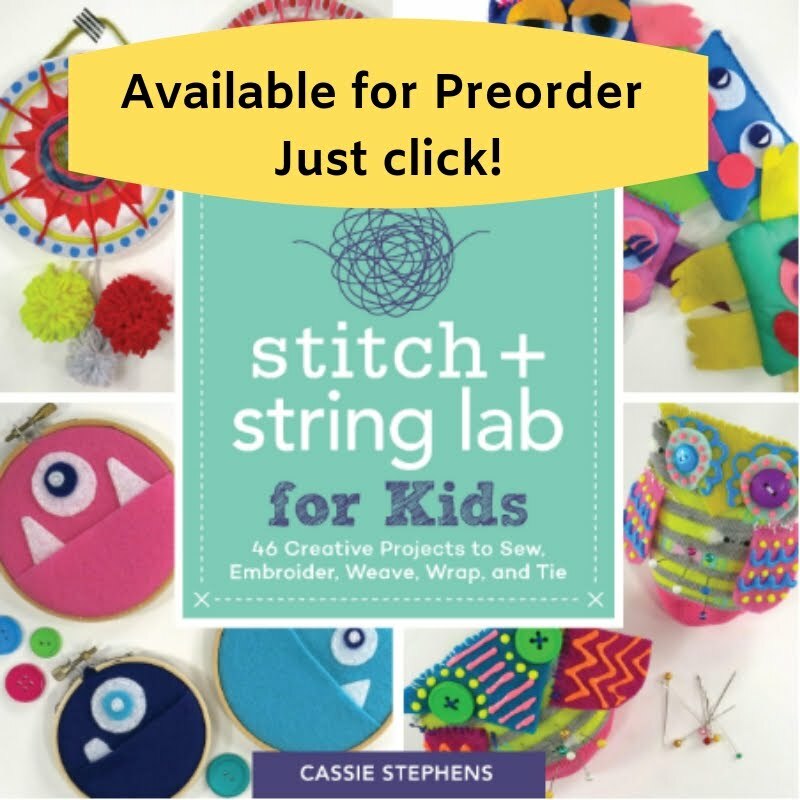 They chose their stitching fabric and learned how to thread and knot their needle. And that was the end of the first day. By the second day, nearly everyone had mastered a running stitch which they are creating around the border of their tapestry. They are SO EXCITED about this project. More to come, promise! My fourth graders are making pillows: emoji pillows, pizza pillows and...donuts! So I had to wear this dress for the occasion. 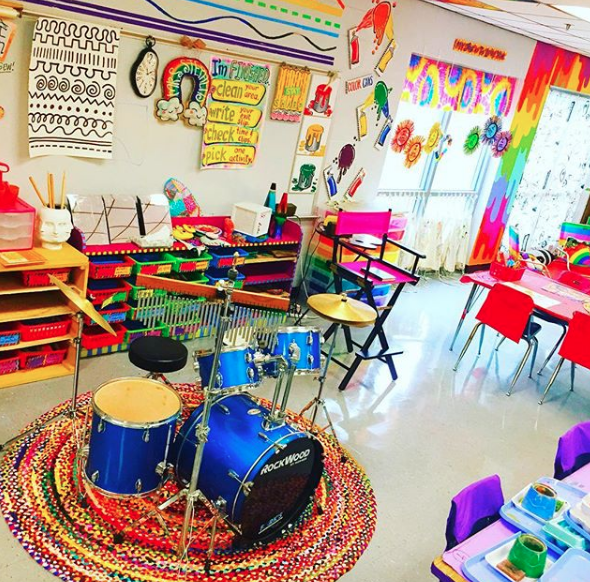 Not sure if I shared with you but I've always had a drum set...but I've not always had it out in my art room. This year, I decided to pull it out again as our Clean Up drums. Last week, each kid learned to play a fill...now, when it's clean up time I pick on kiddo and they go play it as our signal to clean up. The kids have been SUPER respectful of the drums. I'm so glad I busted them out again. 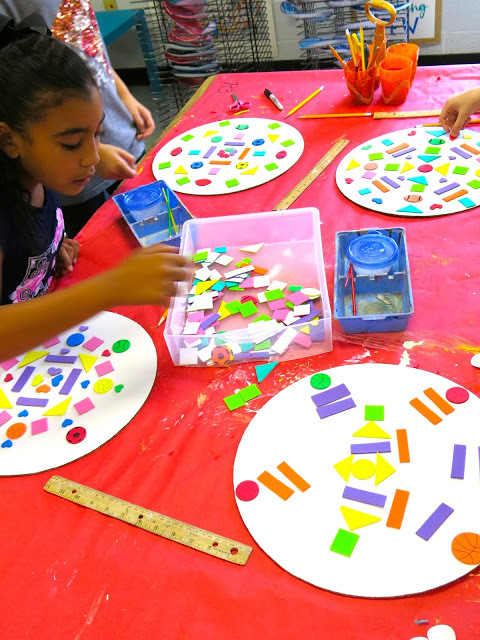 On Friday, we started adding color to our dots! We'll finish these this week and begin painting the back too. I can't wait! My desk! There's always next week, right?! I'm sure it will look exactly like this if not much worse. Oh well! Have a great week, y'all! So...at the BEGINNING of the school year, I got the idea for this collaborative project...and, here we are MIDWAY through the school year and I'm finally assembling and sharing it with you. Story of my life, y'all. At the start of the school year, I dyed a bunch of clothes pins by placing them in a bin of watered down paint. I later learned that food coloring works well also. I dyed them red, orange, yellow, green, blue and purple. 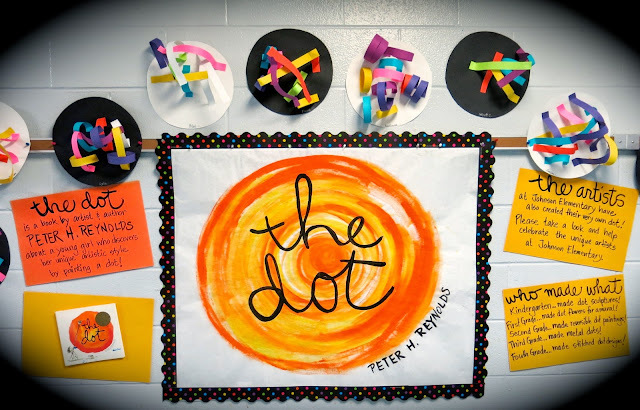 When the students came in, we read The Dot (yes, this was our Dot Day attempt!) and we spoke about all of the things that we are. 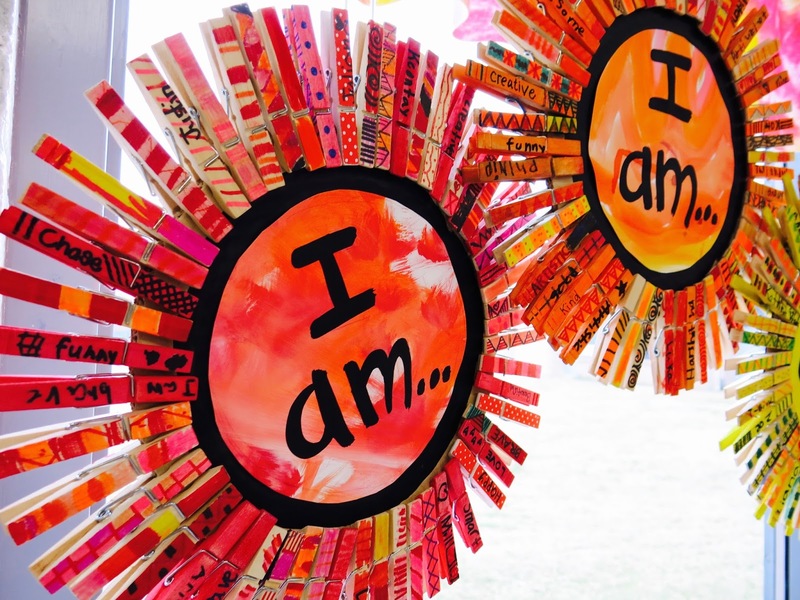 "I am creative. I am amazing. I am silly. I am funny." You get the idea. I had the kids get two colorful clothes pins (any color the wanted) and one plain one. 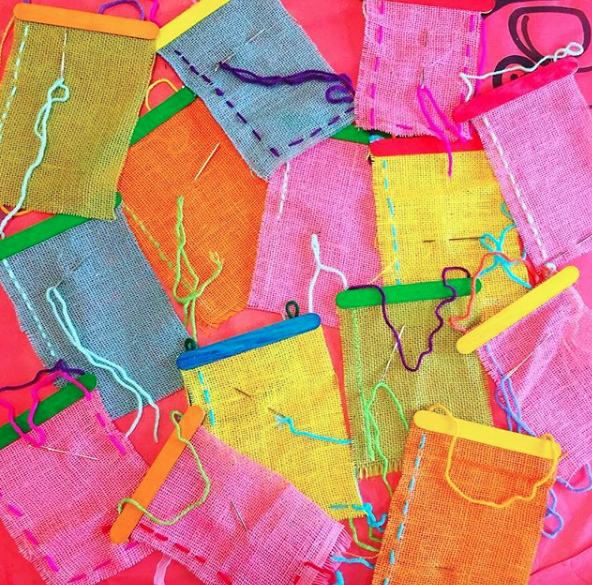 On the colorful clothes pin, they were to write their name on one and a word that described them on another. You can find out details on this project here. I at least managed to get this project finished and hung at the start of the year! 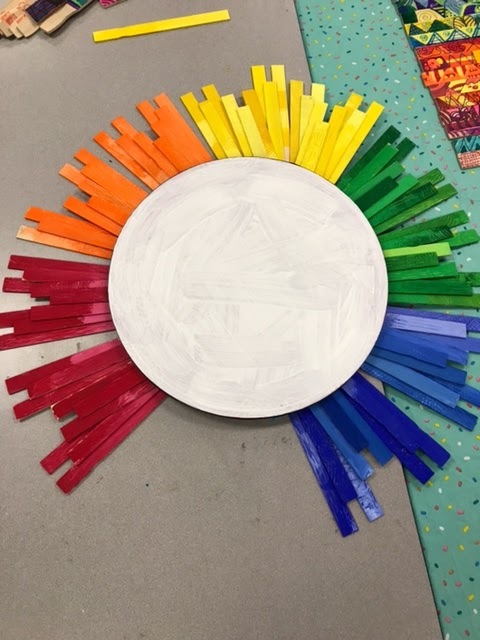 After the kids were done with the clothes pins, I had them sort them by color. Then I clipped them around 9" cardboard pizza rounds. 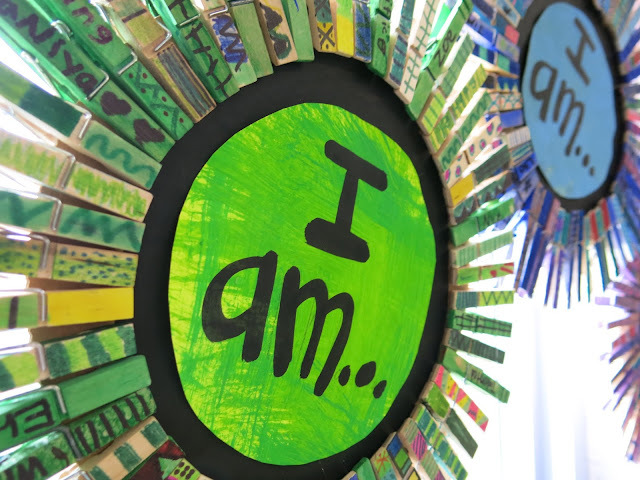 I then painted the center black and used the kids' painted papers to create the I am... in the middle. Initially I was going to hang these in the hallway but I was afraid they would get damaged without a watchful eye on them. AND because they are so stinkin' pretty I wanted to be able to see them all the time! I used command hooks and yarn to hang them above my window. They did keep rotating which would have been fine if I'd had the kids draw on BOTH sides of the clothes pin (which you might wanna do if you do this project). To keep them forward facing, I simply hot glued them together where you see them touching/overlapping a bit. 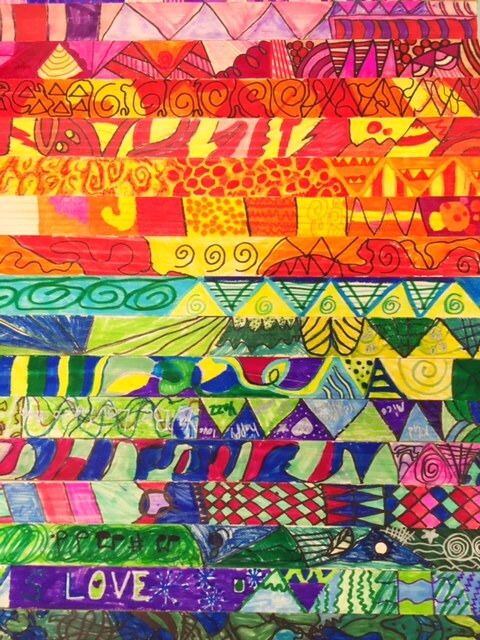 Another happy rainbow addition to the art room that I'm happy to finally have on display! Those who are unfortunate enough to have to work with me know that I'm a bite-off-more-than-I-can-chew/start-now-figure-it-out-later/wild-and-crazy kind of gal. Thankfully, I work with The Best folks who not only tolerate my silliness but, I daresay, encourage and facilitate my weird ways. All that jib-jab to say this: look what the kiddos created for our 2017 collaborative! 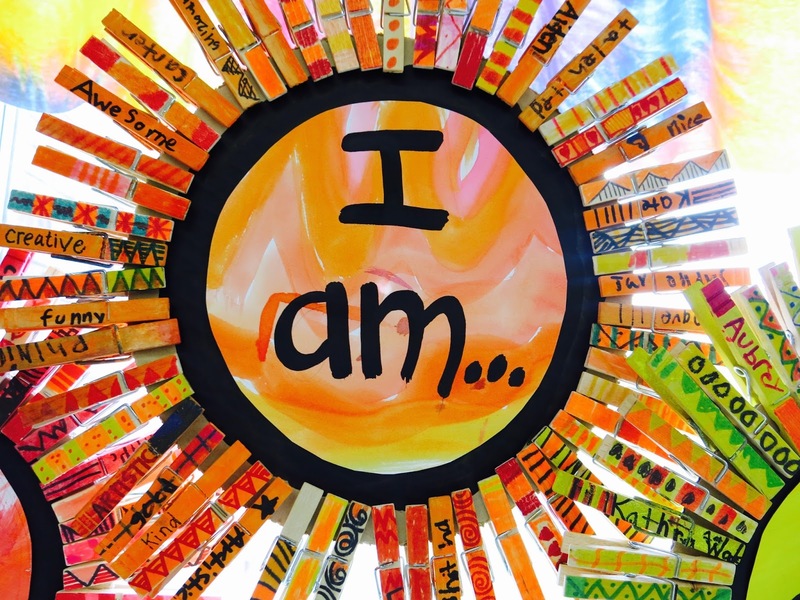 Learning for All with a contribution from each of my first through fourth grade artists and a whole lotta blood, sweat and (after misfires of the staple and hot glue gun) tears on behalf of me and my P.E. teacherin' buddy Ali Starkweather! Ah! This 5' 6" mama weighs in at just over 15 lbs and is every bit of awesome, if I do say so. 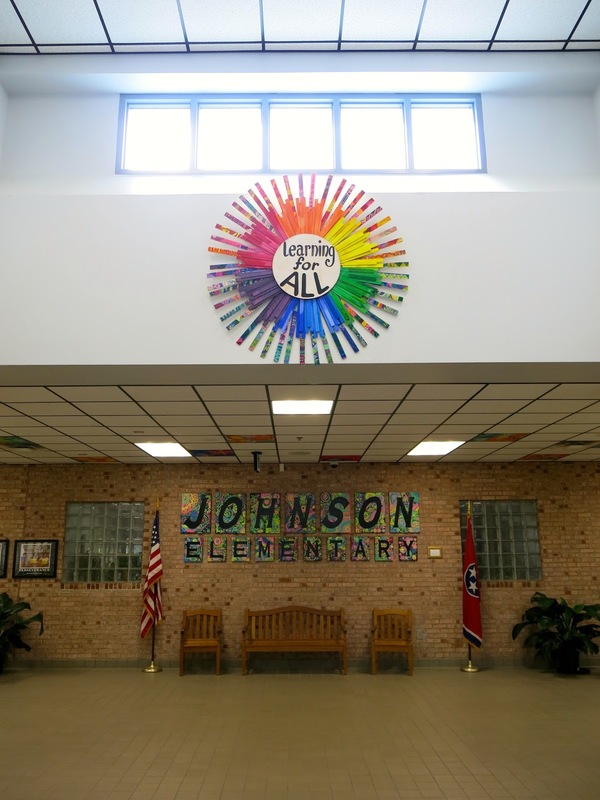 I've had the itch to create something in our foyer every since the kiddos created our Johnson Elementary sign a couple of years ago. And, with the successful creation of this massively heavy mosaic beast, I KNEW the custodians and maintenance dudes could make hang the monster...but how to create it? I originally got the idea this summer while I was at the hardware store and spotted paint stirring sticks. Before I knew what was happening, I was taking the folks at Home Depot into donating a ton of sticks to me for the cause. 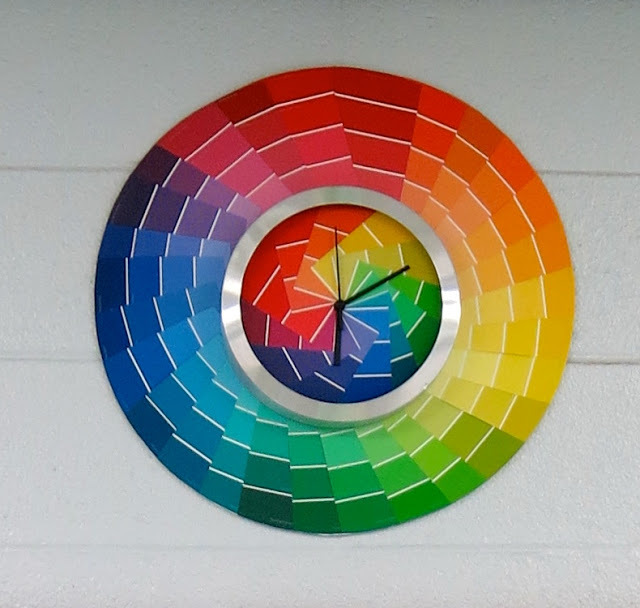 I was inspired by the Color Wheel Clock I created some years ago and just kind of went from there. 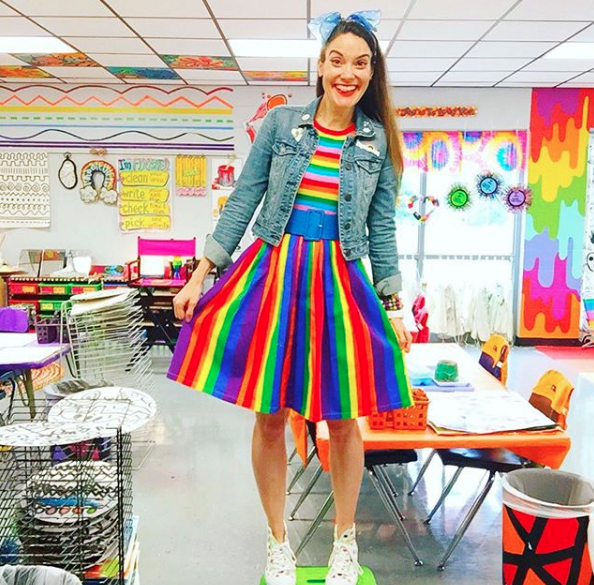 With this inspo in mind, the first days of school, I had my first through third grade kiddos paint a stick with a color and white. 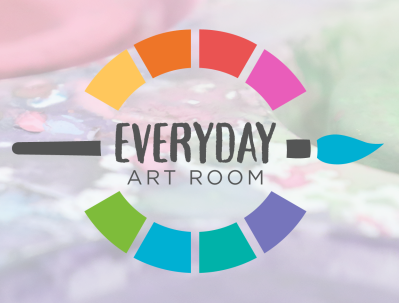 This was easy: after going over the rules, routines and whut-nots of the first day, I was like, here, let's paint a stick, doesn't that sound fun?! After a resounding NO!, I chatted about creating a collaborative and a legacy piece to leave behind. That was a little more inspiring. 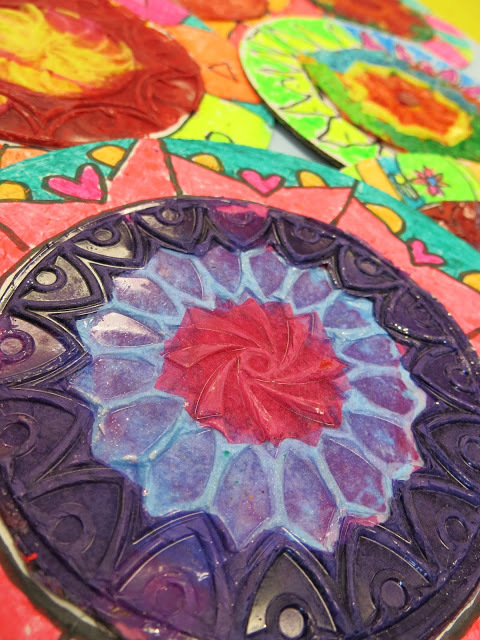 With our leftover paint, we created painted papers for future projects. My fourth grade kiddos were given the large paint stirring sticks. Those I did have to pay for as Home Depot decided they had to draw the line somewhere. I didn't mind. 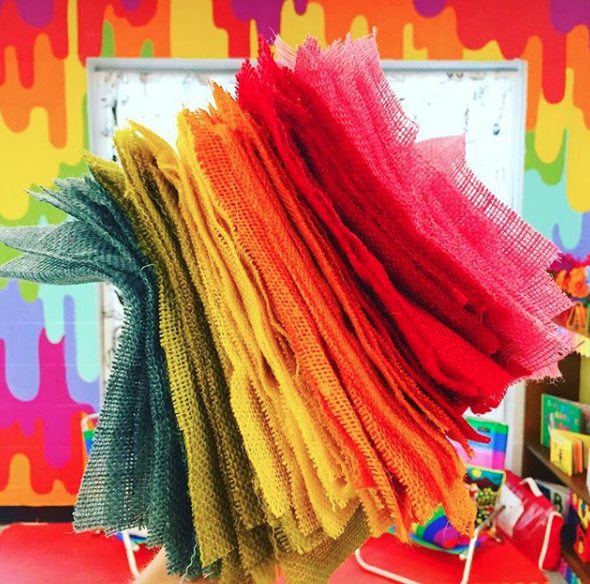 The kids were given baskets of analogous colors and requested to "leave their mark". They happily did so. After a wee sword fight with the sticks. Once all the sticks were complete, the MASSIVE assembling began. I'm not even gonna lie: I hardly snapped any photos as I wasn't sure if this was even going to be possible. In fact, it wouldn't have been possible had my buddy Ali not stepped in. She was determined this was gonna work. 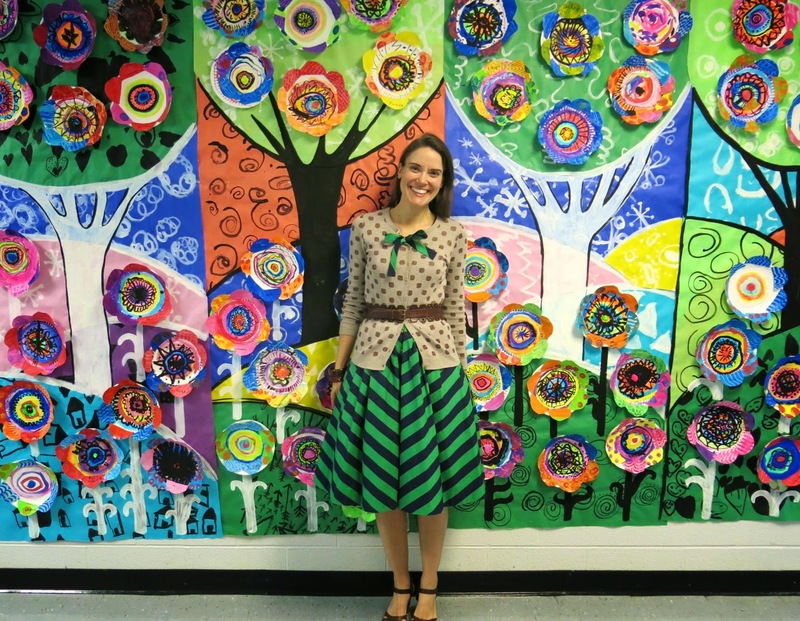 I'm so thankful she helped me...otherwise it would still be in bits in the art room! I just so happened to have the large round canvas at my house, sitting around, collecting dust. Ali and I began by laying out the colors of the shorter sticks and deciding how they would go together. When someone asked how it was assembled, I believe Ali put it best, "Lots of hot glue, gorilla glue, and a staple gun....and then LOTS of hot glue, gorilla glue and a staple gun!!! lol..." She says LOL but what that really means is for real tho. There's a reason we didn't snap any photos of the assembly. Y'all better believe I wanted this bad boy up in time for Open House. And all y'all better also believe it was only finished the day of. In fact, these sweet fellas had to wait a pinch as the wording I had JUST painted needed to dry. And then, of course, the domino effect of disasters transpired: the lift stopped working; I didn't paint the wording to align with the hanger on the back (no surprise there)...but there was no need to worry. By some miracle of miracles, the lift was fixed the so was my hanger malfunction. And, viola! 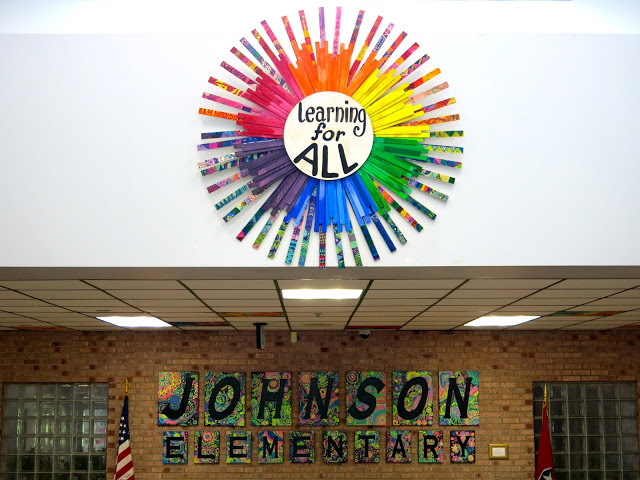 Masterpiece hung in time for Open House! High five to these handsome devils! Every morning, when I do morning duty, I've been pleased as punch to see this happiness greeting our kiddos as they enter our school. 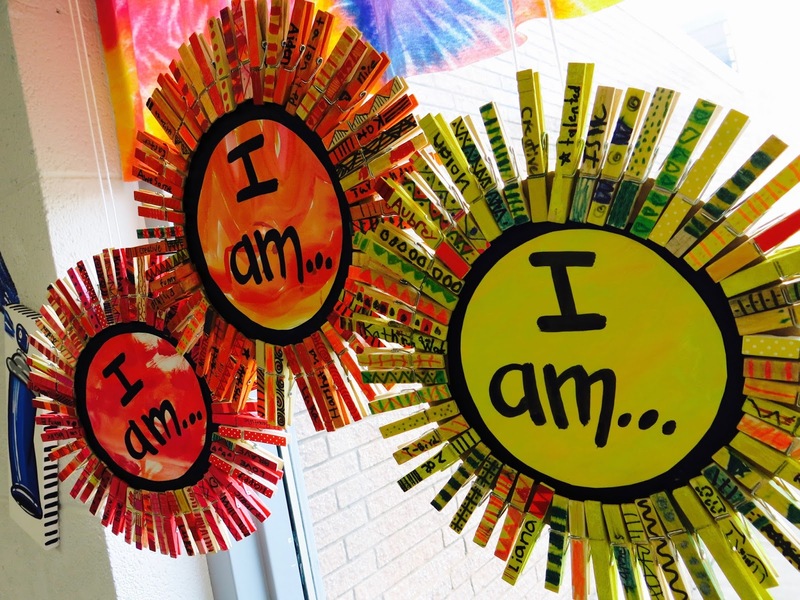 This mantra is a portion of our school motto...and I believe everyone who loves to teach at Johnson Elementary agrees. Even if some of 'em are a wee bit crazy. But I'm in such good company! Thanks for letting me share! This was a fun collaborative...and one that my wee artists and I (as well as all who were involved!) are mighty proud of! Oh boy. We're back! 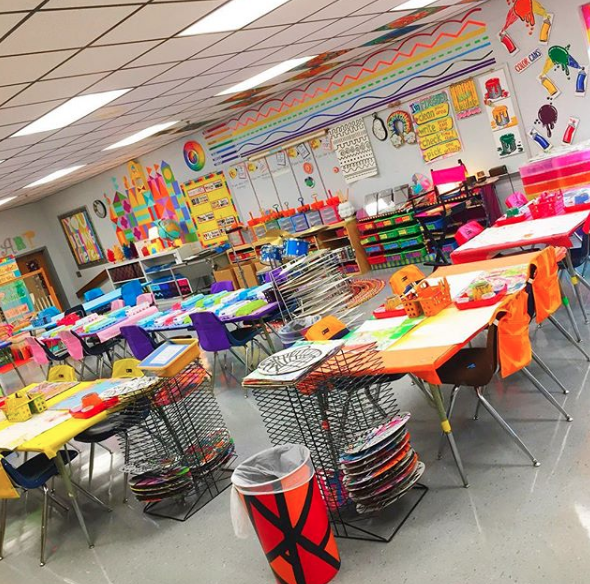 In my district, we returned to school last (officially) last Thursday and it's been nonstop action since: professional development, back to school night, room prep, you name it. The one thing, THE MOST IMPORTANT THING, that I'm currently consumed with is our first art project of the school year. 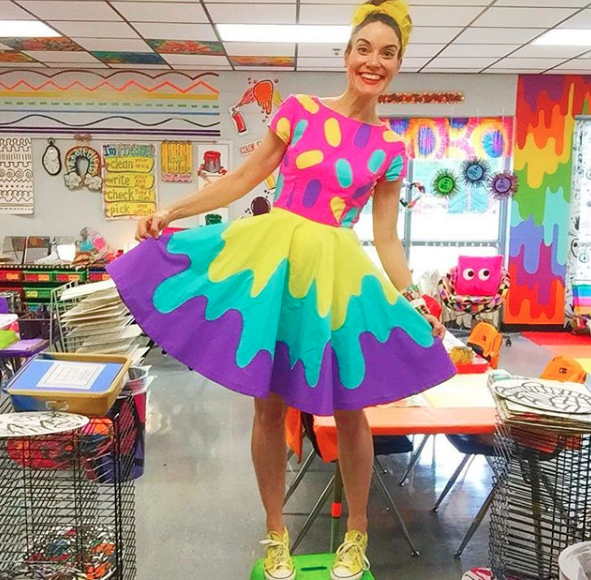 I love to hit the ground running to build excitement and fun in the art room with a big, fat, hairy paint-y, sticky and colorful project. 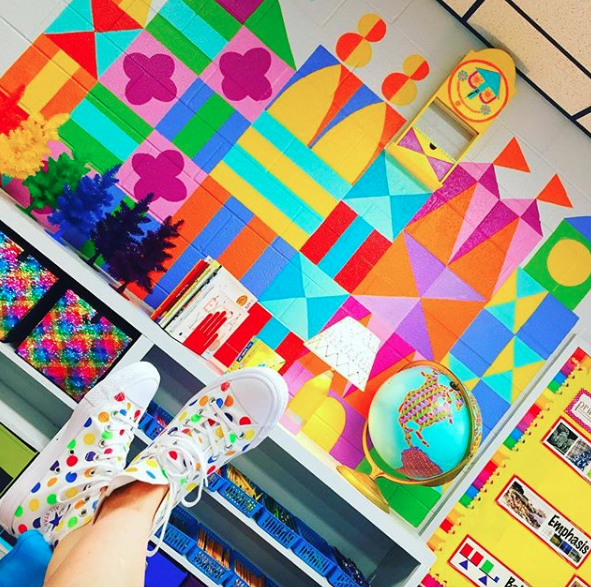 While I wrack my brain over this year's projects, I thought I'd do a lil series on this here blog titled Best Back to School Projects. These aren't the Best Ever, mind you, these are just the best that can be found here. So take that with a grain o' salt. That being said, I LOVE to start my school year reading The Dot by Peter H. Reynolds. It's got such a great message...one that speaks to children of all ages. 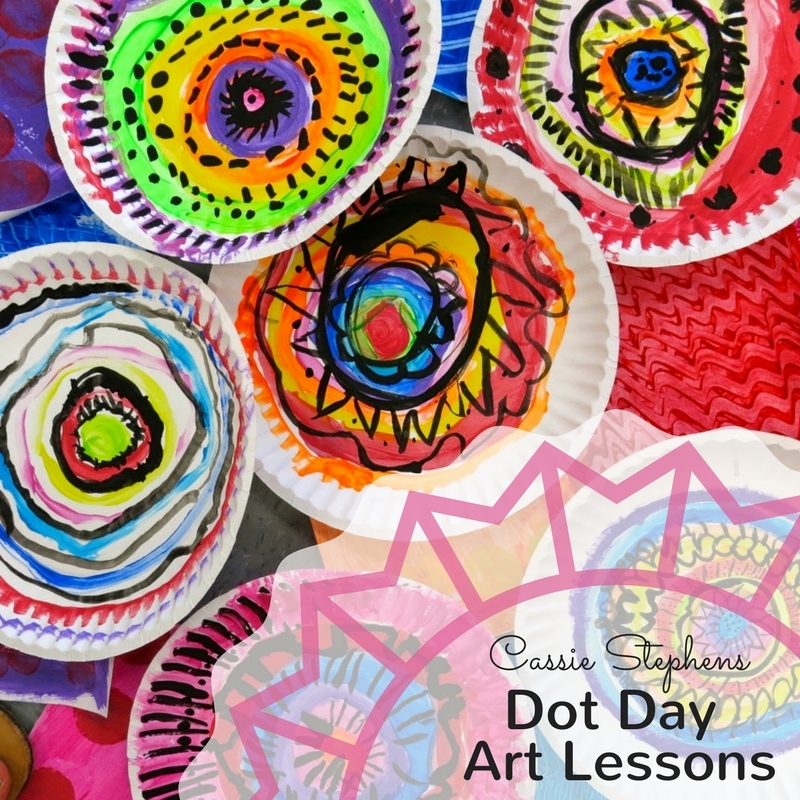 In this post, I'm going to share my very favorite Dot Day projects that I've done over the years with my kindergarten through fourth grade kiddos. 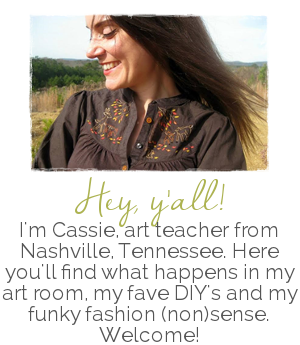 I'm including links to blog posts with lesson details and videos. 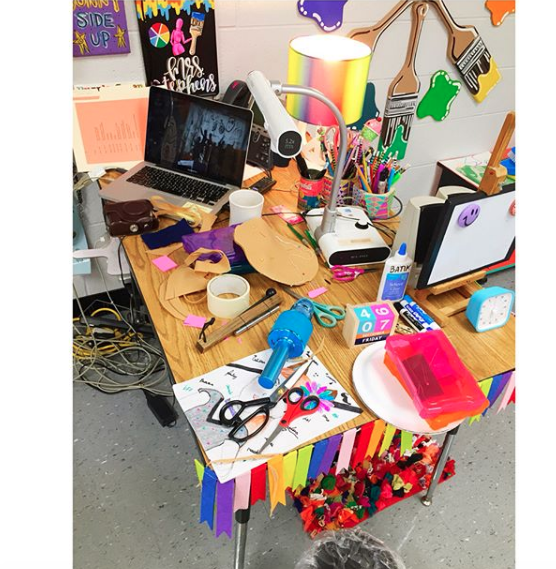 I really started to use videos in my art room last year...so that's why not every project has a vid. By the way, feel free to subscribe here to view newly loaded videos. So, without further jibber-jabber, let's get started! One year, my first grade students created this dot-inspired mural...with a heavy influence by the folk artist Heather Galler. They not only painted the plates but created the painted papers used as the flower petals and the papers used in the background landscape. This one is definitely one of my faves. You can find the lesson details here and here. This fun and quick project can be found in more detail here. 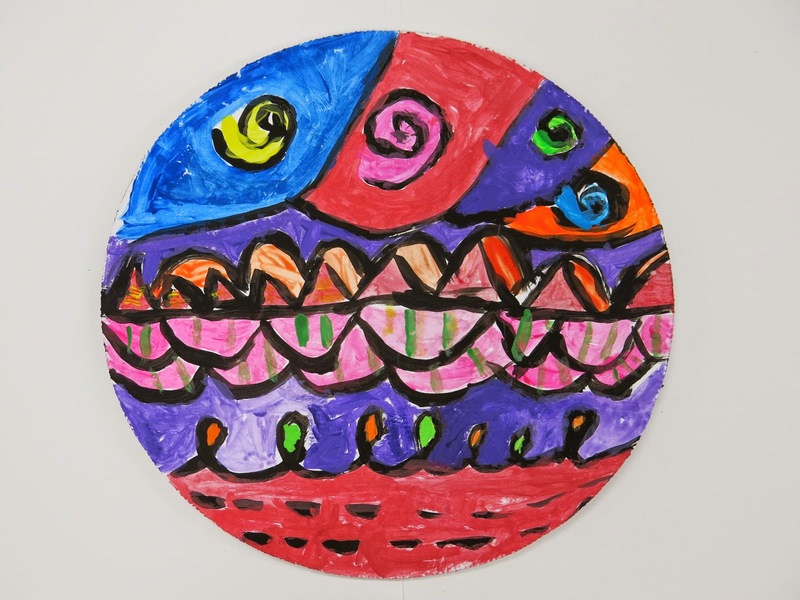 This was one of those quickie projects where everyone in the school created the same thing: a marker design on a coffee filter. 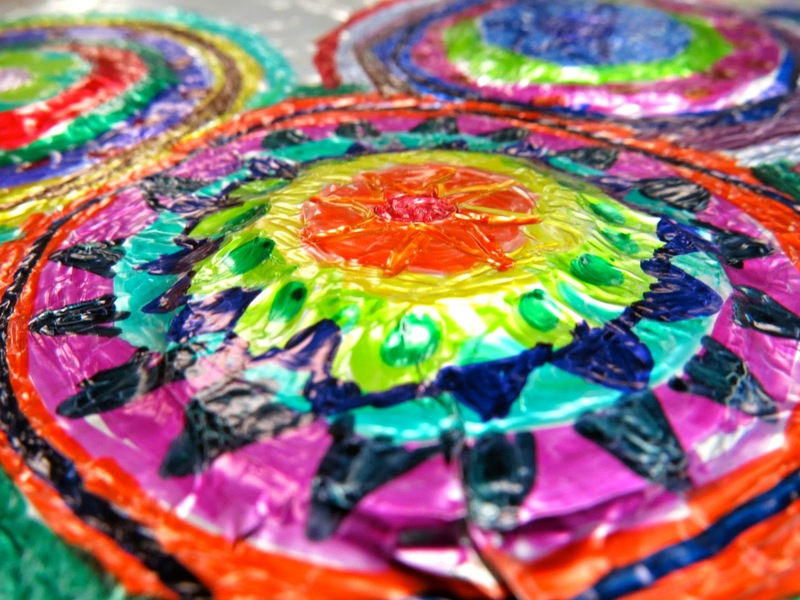 Once each design was complete, the filters were sprayed with water and allowed to dry on plastic. Each was hung by paperclips. This was a show stopper at our Open House...and so stinkin' easy! 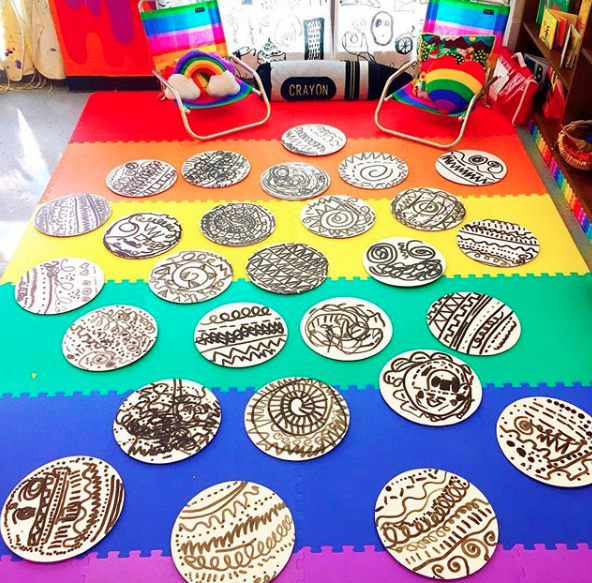 My second graders created these reversible dot paintings one year on pizza rounds I purchased via Amazon. This was a fun project and another were I could display the work mobile style. You can find out more info here. Can you tell I have a thing for hanging things in front of our window? Before you ask: yes, the kids DO touch them and we have had a few fall down. The teachers and I stay on top of reminding them that most art is for looking and not touching but, you know. They are curious kiddos! Last year, second grade created these fun textured dots! 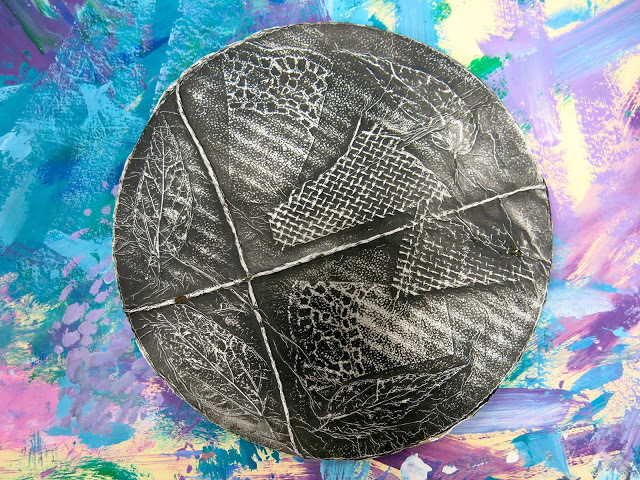 I love this project as it really teaches children so much about texture. I've done various takes on this project. More details here. 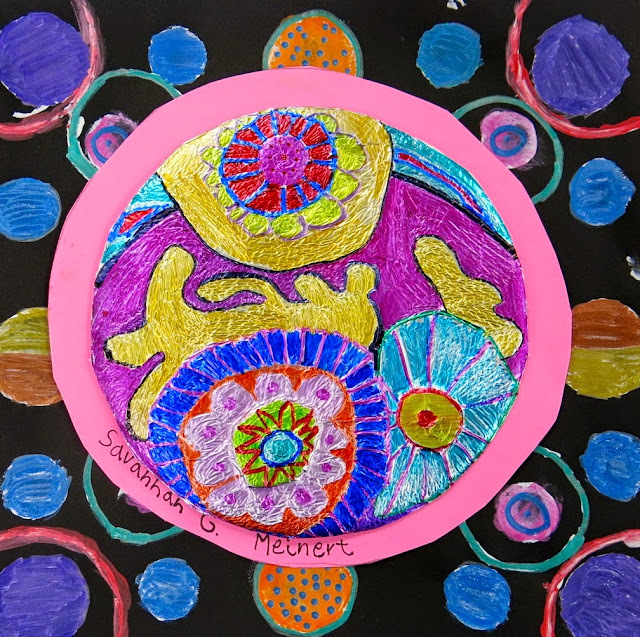 You are more than welcome to use my videos in your art teacherin' world! A couple years ago, my third graders created these dotted relief sculptures with Styrofoam plates and aluminum foil. 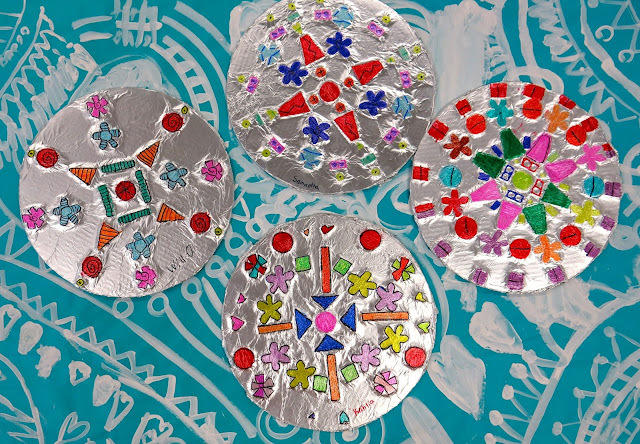 I love shiny and reflective surfaces for the kid's creations. And they do to. The Sharpies used really take on a new life. 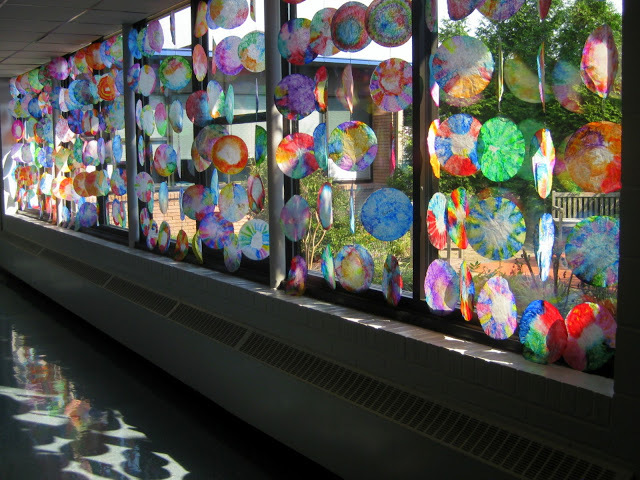 Last year my third grade created these amazing dots! This project was a huge hit with the kids. It also sparked a lot of conversation in the halls that started with, "How did they make this?!" 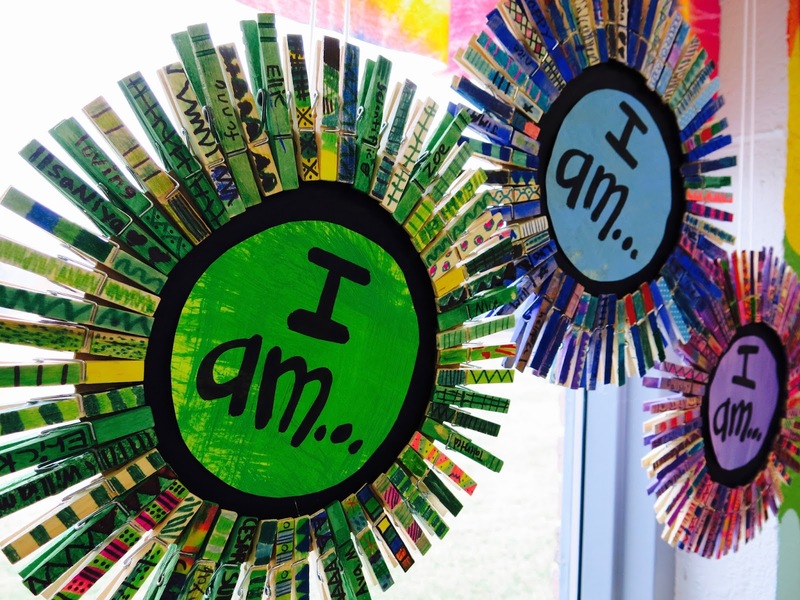 Third grade project can be found here. Using pre-cut tissue paper found at The Dollar Tree REALLY saved on prep time! 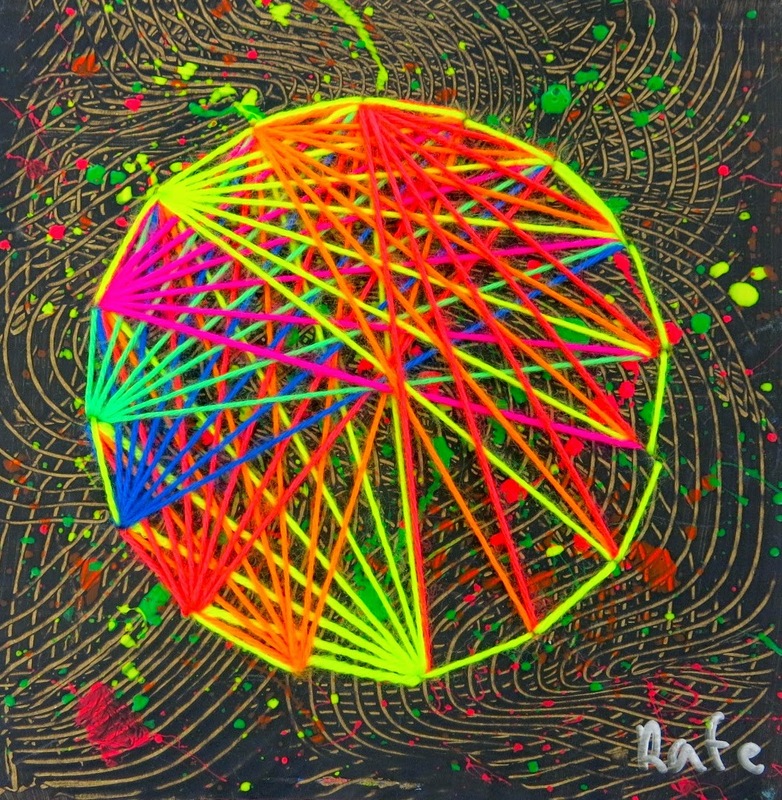 I've been a big fan of string art since 5th grade when my teacher introduced me to it. I still have my string art example that I share with the kids. This project is a FAVORITE of theirs, it's so much fun. 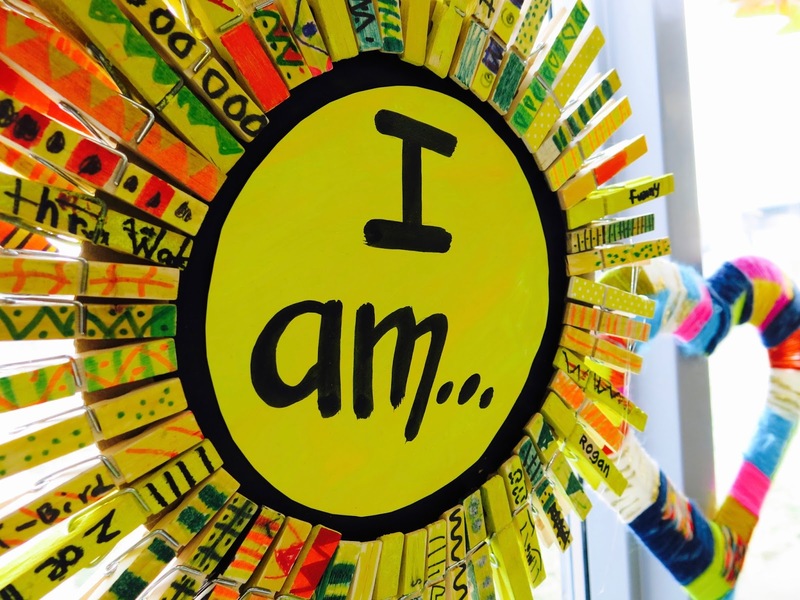 You can find lesson details here. Having a video really helps with a project like this! 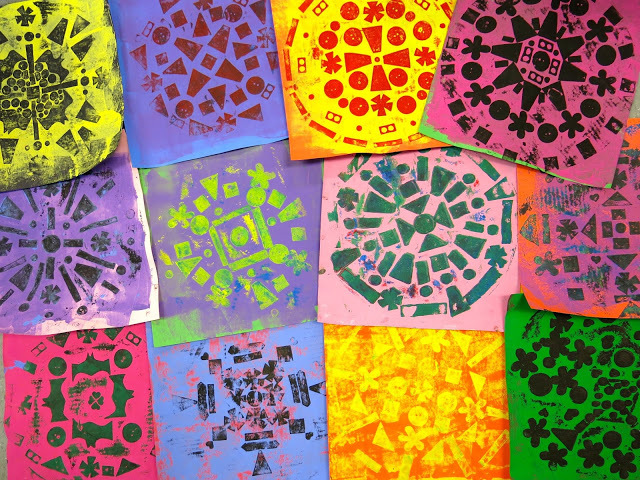 Radial printing project with fourth grade can be found here. 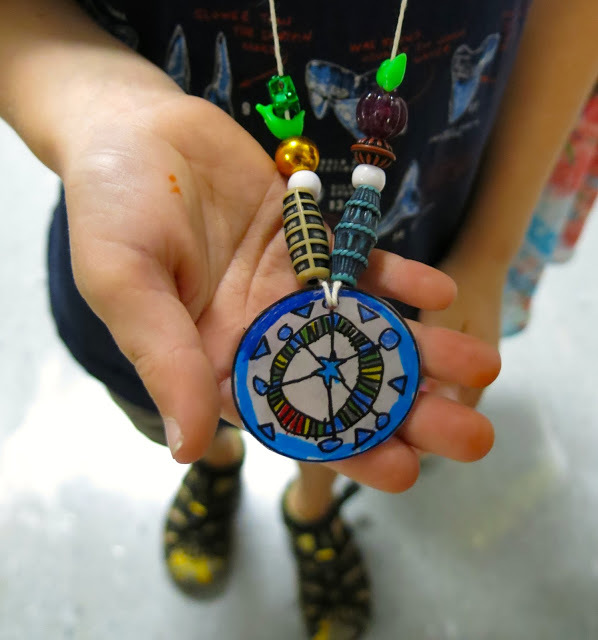 Again, we used pizza rounds for this project and it was a great way to kick off the school year. The kids really enjoyed working with the foam stickers to create their designs. I did question my sanity doing printmaking with 35 fourth graders during the first month of school but they really loved it. Printmaking is always action-packed tho, am I right? Once printmaking was complete, we covered the boards in aluminum foil (again, see a pattern here?). This was a fun way to allow those early finishers to continue creating while my other students were still printing. Full lesson here. I don't usually repeat projects but when I do, it's projects I've done with kindergarten that I know are successful. 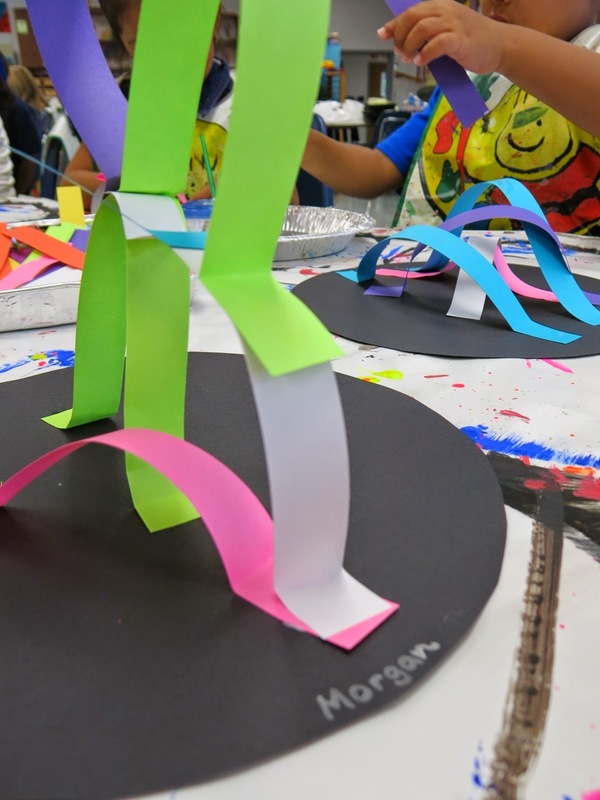 One project I ALWAYS do on that very first day in kindergarten is have them create line sculptures. I begin by introducing them to line with his poem. And then we dive in. This is one of my favorite days of the school year! 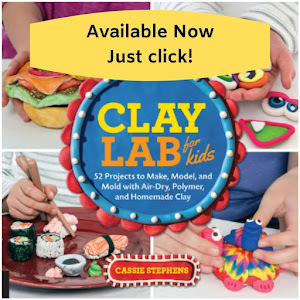 I promise you, the kinder kiddies will love this project. You can check out more dot stuff here but you might enjoy this unit I created about LINE for kindergarten. I promise you, y'all will have the best time with this project! 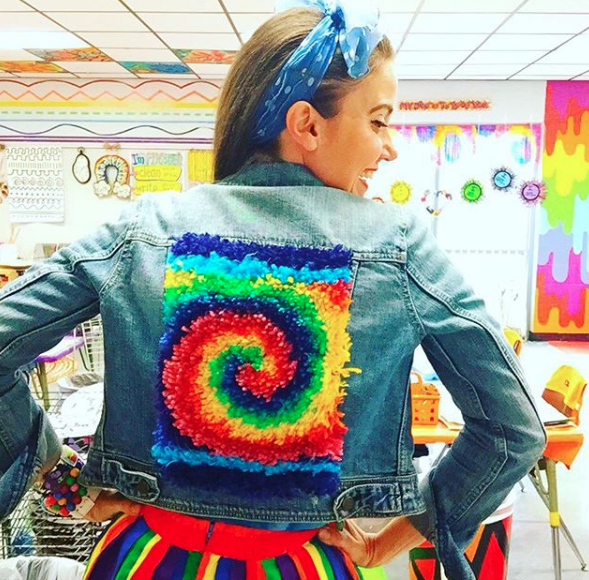 I'd love to hear your fave Dot Day projects. 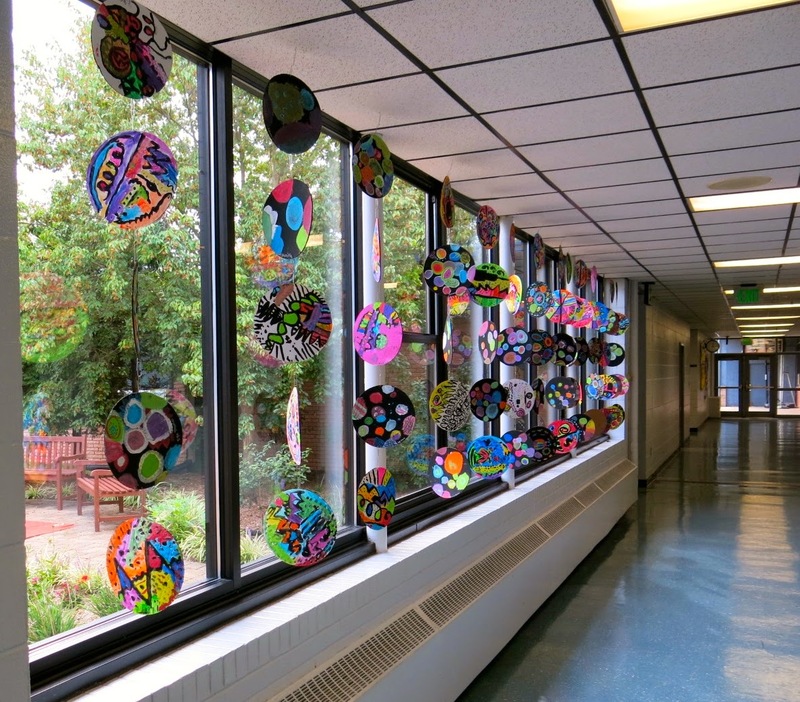 International Dot Day is on September 15-ish and you can read all about it here. Last year, to celebrate, some of my classes made Shrinkie Dink Dots! More details here.